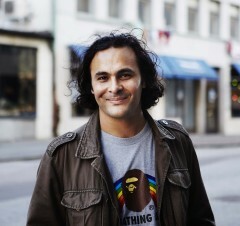 Kader Attia was born in 1970 into an Algerian family in Paris. He studied both Philosophy and Fine Art in Paris and spent a year at Barcelona’s School of Applied Art in 1993. His childhood between France and Algeria, going back and forth between the Christian Occident, the Islamic Maghreb and the Jewish Algerian Sephardic world, has had a profound impact on his work and time spent living in the Congo-Kinshasa, as well as Venezuela has further informed his vision. His work tackles the increasingly difficult relationship between Europe and immigrants, particularly those of Islamic faith. Attia’s first solo exhibition was held in 1996 in the Democratic Republic of Congo. He gained international recognition at the 50th Venice Biennale (2003) and at the Lyon Biennale (2005), where he exhibited the work Flying Rats, an installation of life-size, birdseed sculptures of children being devoured by a flock of pigeons. Recent exhibitions include La Force de l’Art, the Paris Triennial and the Havana Biennale. In 2010, Attia will take part in the Sydney Biennial and the Smithsonian Artist Research Fellowship Program amongst other projects. Attia is also one of the winners of the 2010 Abraaj Capital Art Prize, an award granted specifically to artists working in the Middle East, North Africa or South Asia.